Why is Gujarat, an otherwise ‘developed’ state, with an agricultural growth rate ostensibly much higher than other states of India, as claimed repeatedly by the Government of Gujarat (GoG), reeling under the anger of farmers? If the GoG’s claims of development are indeed true, then why is the average monthly farm income at a mere Rs 3573? And why is Gujarat at number nine in the country in terms of farmers’ incomes? While the GoG as well as the Government of India (GoI) are claiming the high growth rate in agriculture in Gujarat as proof of the success of the ‘Gujarat model’ and farmer satisfaction with the policies and programmes, the farmer unrest in almost all parts of Gujarat is a reality that was tested in the Assembly elections of 2017, where the ruling BJP lost much ground on rural seats. The same figure is also reported by “The State of Indian Agriculture” (GoI, 2015-16). 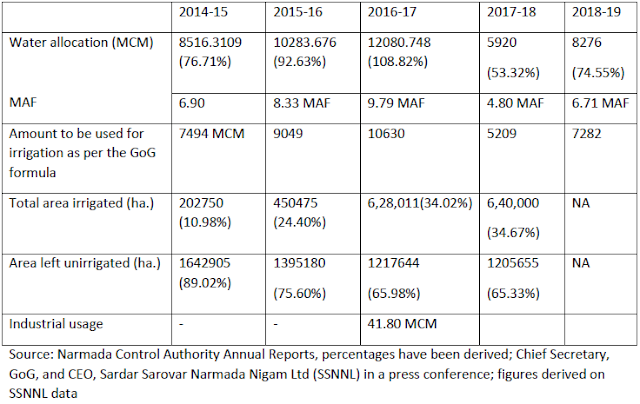 However, the Narmada, Water Resources, Water Supply and Kalpasar Department (NWRWS) website shows that the irrigated area by all means of irrigation in 2006-07 was 12,16,130 ha. which declined in 2013-14 to 10,63,190 ha..
By any standards, the area under irrigation is still less than half the total cultivated area, and the GoG’s lack of effort on this front is more than evident. So much for ‘good governance’ and ‘minimum government’. Now to come to the Narmada water and the Sardar Sarovar dam. Here too, the irrigation potential that had to be created, of 18,45,655 ha, is in 2017-18 still languishing at 6,40,000 ha which is a mere 34.67% of the total potential. This, after almost 17 years of the Narmada water flowing in the main canal. 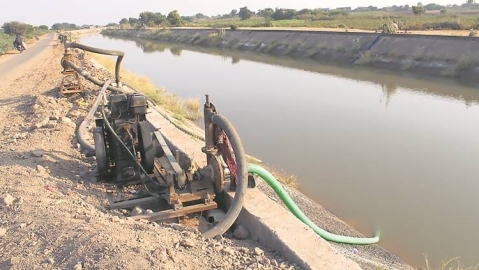 The canal network remains unfinished and the most important component of the canal network, the sub-minor canals, is at a mere 53.5% as per the Narmada Control Authority (NCA) Annual Report of 2016-17. But the more important point here is the irrigation water that was to have been provided by the Narmada canal and the irrigation water that has, in fact, been provided to Gujarat. Much obfuscation is undertaken in the official reporting, apparently to hide more than to reveal. However, it does reveal a few things. Against the NWDP award of 11,101.00 MCM to Gujarat the water received has been, depending upon the rainfall in that year, around 76% to 108%. About 88% of the allocated amount of water was earmarked for irrigation by the GoG. 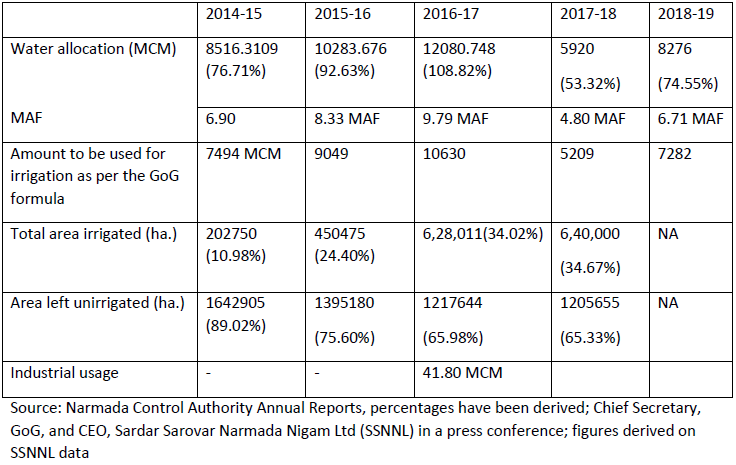 An example of obfuscation is that the report fails to mention the amount of water that Gujarat utilized for irrigation, drinking water purposes and industrial use, except in 2016-17 (where the industrial usage is mentioned).However, the usage figures for irrigation and drinking water have to be guessed, if one is to go by the NCA reports. Till 2017-18, the GoG had been able to provide irrigation to only 640000 ha of the total command area, which is a mere 34.67% of the total command area. In other words, nearly 12,05,655 ha or 65.33% of the total command area has been allowed to remain unirrigated, either through acts of omission or commission, on the part of the GoG or the SSNNL. Had the water been utilized in the right proportion, as indicated in the above table then the irrigation potential of 18,45,655 ha would have materialized by now. The canal network has not been completed, and even after 17 years of the water having been released into the main canal, the minor and sub-minor canal network remains ‘a work in progress’. The ultimate irrigation potential through the surface water is assessed at 48.11 lakh hectares which includes 17.92 lakh hectares through Sardar Sarovar (Narmada) Project. Similarly, in respect of ground water resources, it is estimated that about 20.04 lakh hectares can be irrigated. Thus, total ultimate irrigation potential through surface and ground water is estimated to be 68.15 lakh hectares.The total irrigation potential of surface water created upto June-2017 works out to 90.62 percent of ultimate irrigation potential whereas maximum utilization works out to 68.25 percent of the irrigation potential created (“Socio-Economic Review, Gujarat State, 2017-18”, p. xix). It is reporting on “irrigation potential created” and how much area “can be irrigated” as against how much is actually realised on the ground, on which it is strategically silent. "Overall 100% main canal, 99.90% branch canal and sub-branch canal other than Kutch branch canal (KBC), 80% of KBC, 40% sub branch canal of KBC, 90% of distributaries, 78% minors, 100% sub-minors under conventional system and 41% Sub-minors under underground pipelines (UGPL) are completed for creating irrigation potential of 79% up to minor level and 53.50% up to sub-minor level up to March 2017." But a crucial admission by the Authority is inadvertently let out. They admit to having created an irrigation potential of up to 53.5% (up to the sub-Minor level, which is the most important indicator for irrigation). 53.5% of the total irrigation potential amounts to 9,87,425 ha. However, only 6,40,000 ha. or 34.67% of the total command area is actually provided irrigation water. What about the rest of the 3,47,425 ha? But even more importantly, where is that water going? Why is that not reported in the various reports of the NCA, SSNNL and GoG? It is amply clear that the farmers and agriculture are not suffering on account of deficit rainfall. Rather their misfortunes are on account of the chest-thumping bravado of the GoG, hiding the utter neglect and mismanagement of the GoG. The supreme confidence of the utterly foolish.